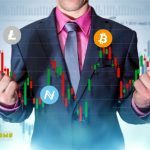 Cryptocurrency Market Analisys: Will The Upward Correction Be Delayed? Speaking about the cryptocurrency market, many mean Bitcoin, and speaking about BTC, they mean a cryptocurrency market. This is normal and natural, since it is Bitcoin that remains the “guide” for all other digital currencies. For several weeks, we observed how the market was declining after a prolonged correction. And now, perhaps, we are again at the door of a new correctional period. But there are questions: “Is it really now?” and “How long for?”. Speaking about the future growth it is visible that the rate of decrease not just slowed down, and even stoped. Such technical picture assumes possible development of short-term correction after which the next impulse of decrease, and delay in the market in a medium-term flat will follow. Definitely, while we can say that Bitcoin (for example, as well as the entire cryptocurrency market) is still in a bearish phase, and in the near future it will not end. 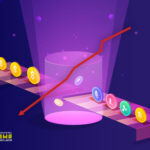 To understand the current mood of the market, its immediate and distant prospects, it is necessary to consider the dynamics of the first cryptocurrency on several charts and from different angles. On the daily chart, Bitcoin continues to move in the decreasing channel. The reduction targets are on its support line, and one of the main ones is the $ 2,750 mark. Resistance for the long-term trend is located at around $ 5,740. Stochastic indicator enters the oversold zone, which may mean a pullback, but to confirm it is necessary to wait for the “golden cross”. The four-hour chart demonstrated that convergence was formed on the MACD and Stochastic indicators. At the same time, Stochastic is in the oversold area. Together, these factors indicate the beginning of the corrective movement. In addition, it is worth noting that the local growth impulse overcame the resistance line of the downward channel, thereby giving a start to a short-term correction, which could turn into a medium-term one. 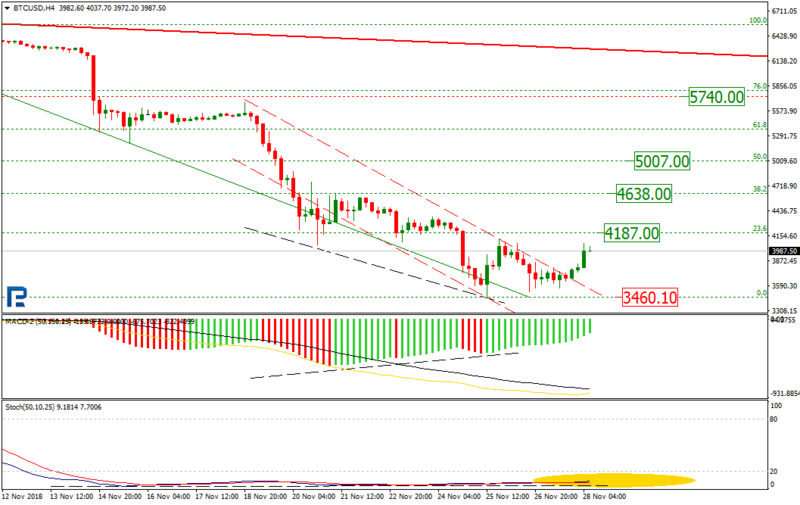 Its main targets could be 23.6% ($ 4187), 38.2% ($ 4638) and 50.0% ($ 5007) on the Fibonacci scale. On the hourly chart, BTC demonstrates an attempt to build an uptrend channel. At the same time, the “golden cross” at Stochastic serves as an indirect confirmation of the growth impulse development. Its immediate goal will be the line of resistance of the emerging channel, and the $ 4187 will help to orient with time. Having overcome the resistance line, the quotes will move to the upper projection corridor, where the growth targets will be $ 4,638 and $ 5007. The main support is the minimum level - $ 3460. To determine the current state of affairs of EOS cryptocurrency, it is worth considering the chart on the hour timeframe. Here we can notice that after the last minimum update, the market has formed a convergence on the MACD and Stochastic indicators, which may mark the beginning of the development of an upward correction. We also see that quotes are testing the resistance lines of the short and medium term channels. Current resistance is near $ 3.28. The breakdown of this level will confirm the hypothesis of the correction development. Having overcome the current resistance level, quotes may trade in the projection corridor and aim at levels of 23.6% ($ 3.49) and 38.2% ($ 3.88) on the Fibonacci scale relative to the previous downtrend. Another confirming factor in the development of a short-term upward correction could be the “golden cross” on the Stochastic indicator. 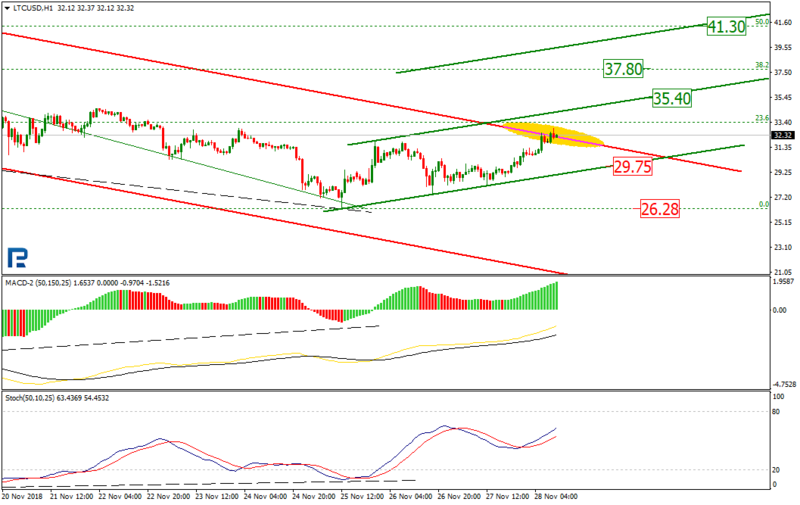 The downtrend ended in convergence on the MACD and Stochastic indicators. To date, the market is forming a phase of correction in the form of an outset, but the corridor has a chance to expand and grow to the projection channel resistance at $ 127.26, corresponding to a level of 23.6% on the Fibonacci scale. Eliminating the development of an uptrend to the levels of 38.2% ($ 145.93) and 50.0% ($ 160.62) is also not worth it. Ongoing support is near the psychologically important $ 100. 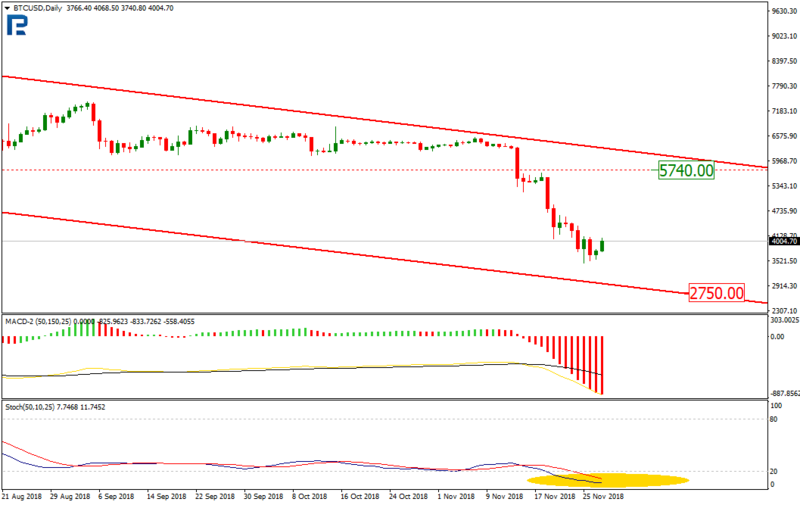 On the hourly chart, we can observe testing of the resistance line of the medium-term downward channel. It is also worth noting that the last growth impulse overcame the local maximum and built the structure of the upward dynamics. The market warned of a pullback by the earlier formation of convergence on the MACD and Stochastic indicators. So far the previous descending trend is corrected for 23.6% on Fibonacci's scale. Overcoming and fixing above the tested resistance line is able to allow quotations grow up to the level of $35.40. 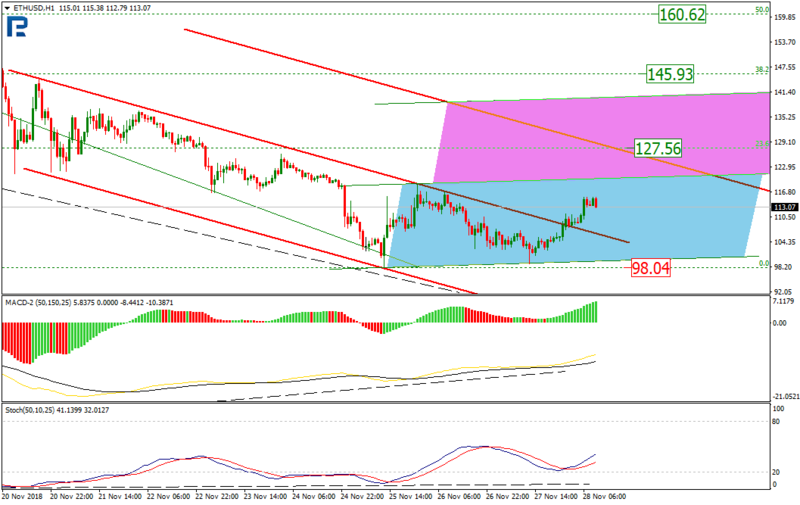 After breaking through it, the market can continue to develop the upward movement to the levels of 38.2% ($ 37.80) and 50.0% ($ 41.30), which are located within the upper projection channel. But if the market fails to break through the main line of resistance, LTC/USD will direct to local support - $ 29.75, and later to the main - $ 26.28. On the hourly chart XRP is testing support line of a medium-term trend. But the short-term technical picture indicates change of a trend after overcoming resistance of the short-term channel. 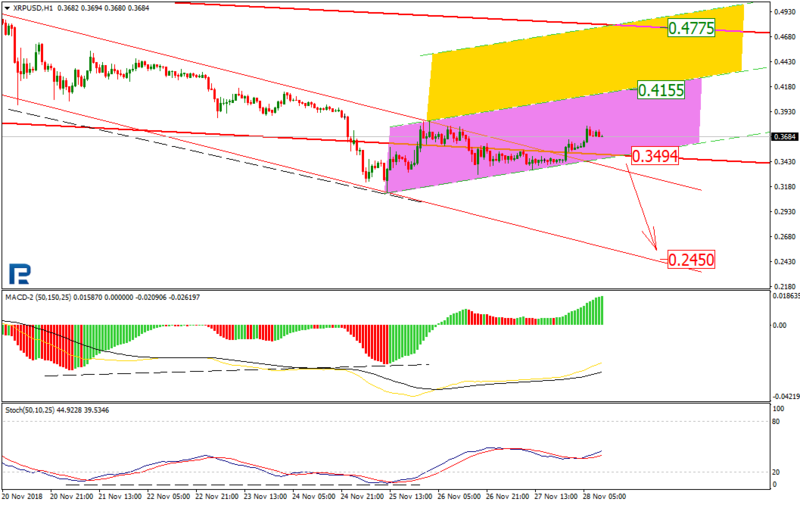 Also change of the direction has preceded by formation of convergence on MACD and Stochastic indicators. The primary target may be the resistance level at $ 0.4155, and its breakdown will open up the quotes for the main resistance level - $ 0.4775. But the uptrend may be short-term. 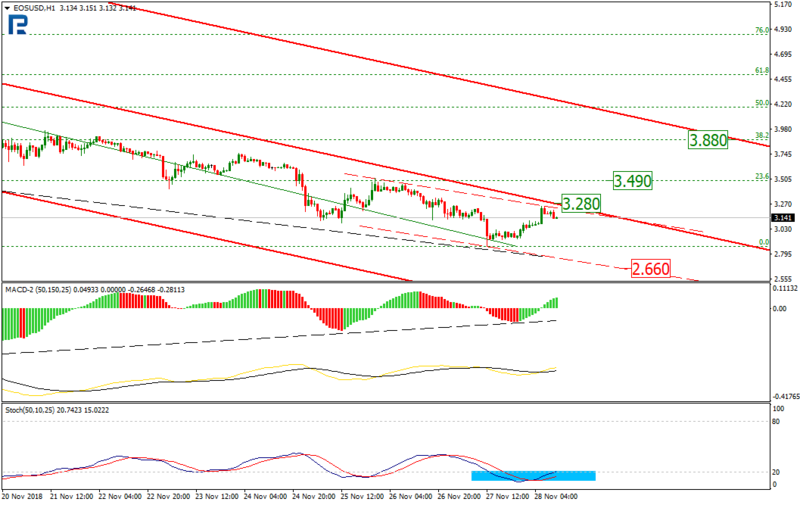 The breakdown of the current support around $ 0.3494 will allow the price to continue to decline to the level of $ 0.2450. © 2018 bit.news | queries 220, for 0.441 sec.